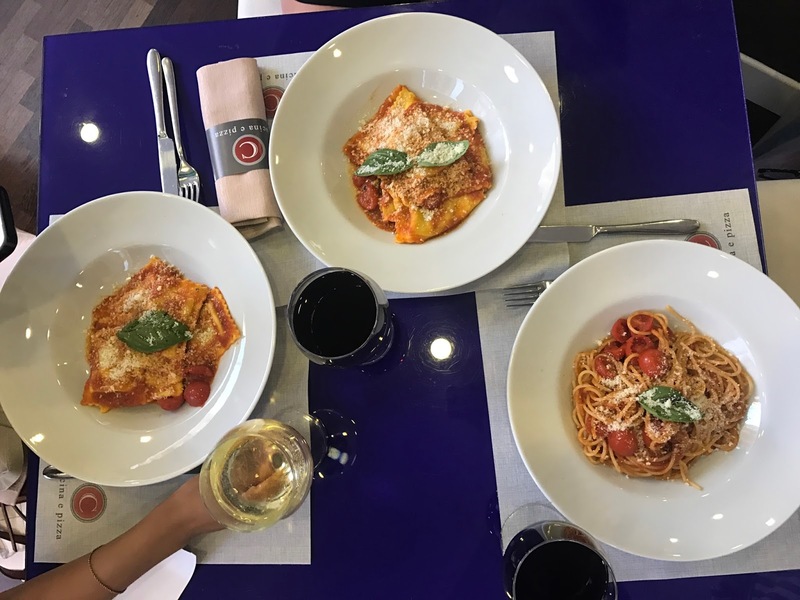 The last big adventure we went on was a two part fold in Italy. This specific post I will share my travel experiences in Rome and have another page for The Almafi Coast here. In a few earlier posts, I wrote about the struggles of being a student traveler and having only the weekend to tackle all we needed. This trip was quick adventure that we tackled. I had Rome on the top of my places to visit and I was going to try my very hardest to get there. Our trip to Rome was only for 24 hours because we wanted to explore the Almafi Coast that very weekend. We left Barcelona early in the morning and mapped our key locations to visit within 24 hours. We knew we did not have time to go in and tour Rome greatest treasures, so we settled on visiting them on the exterior. After checking into our Airbnb we quickly changed from our travelers clothes to our tourist attire. First on our list was the Colosseum. 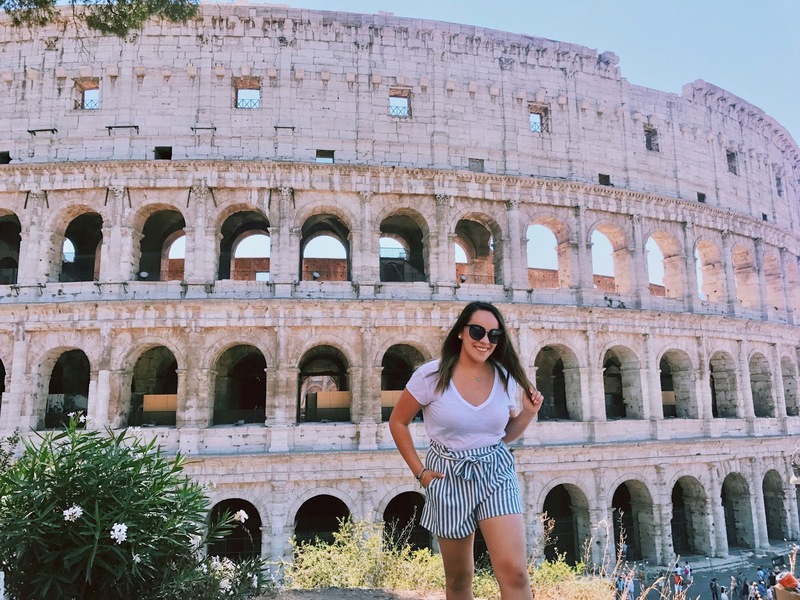 Ever since I was a little girl I watched The Lizzie McQuire Movie and knew one day I would get to see the famous Colosseum in person. 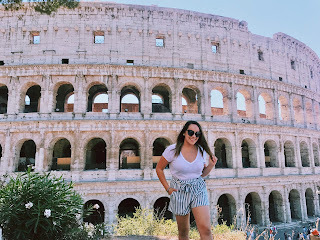 Now lets not forget that it was about 90 degrees outside with no air conditioning and when we walked up to the Colosseum my body was covered in chills from head to toe. That sense of awe that I had finally made, I was here. Next we ventured to the Trevi Fountain to make a wish and continue our journeys. Before heading to the Trevi Fountain we were stopped by a taxi driver that was offering a ride for 70 Euros. Excuse me? No taxi in Europe has every costed 70 Euros. What we quickly discovered is that the taxi drivers in Italy will try their very hardest to drain you of your money. Be careful of this when visiting Italy. Besides dealing with scammy taxi drivers, we walked until we found the fountain. We had to squeeze our way through crowds of people also waiting to toss a coin over their shoulder for the chance of making a wish. My wish? I can't share, but I pray everyday that it comes true. After Trevi we stopped for some gelato, which turned out to be the BEST gelato I have ever tasted. The shop was located right by the Trevi Fountain to cool off and take it all in. I ordered watermelon gelato and to this day have had a hard time finding anywhere else that serves watermelon. While wondering through the streets of Rome we found ourselves on the famous Spanish Steps. Fitting as we were study abroad students in Spain. These steps were magical, I couldn't help but think about all the history it held. As I walked up the steps I noticed the white marble was worn and concave. This sent chills down my back as I pictures the billions of people that visiting these very steps. With the day coming to a quick close we had one more place on our bucket list, Vatican City. Growing up catholic I absolutely had to make a visit. Unfortunately we did not have the time to actually go inside so we settled for snapping a few pictures in St. Peters Square admiring what could possibly be inside. Finally it was time for dinner, pasta was calling my name. We searched for a restaurant that we could all agree on, and the wait was totally worth it. My stomach was filled with pasta and house red wine, the best I have ever experienced. No to mention a second serving of gelato for our walk back to the Airbnb. To my surprise I had a good friend from back home visiting Rome the very same day. I was thrilled to see a familiar face in a sea of strangers thousands of miles from home. We all met up at an Ice Bar in Rome. Going into the bar with the idea of having one drink ended up as one of my favorite nights in Europe. Again we friended the bar tender, and the only way to keep warm was to keep drinking. Before we knew it we shut the bar down and caravanned with new made friends to another bar down the street. Including the bar tender from the Ice Bar. These new friends were from all around the world, and for that one moment in life we shared the same night together. Thats the magic of traveling, you share all these new experiences with new people the you may never see again. Once the night ended and we stumped our way back to the Airbnb it was time to pack up and leave once more. This time instead of flying we took a train from Rome to Napes for our next journey.